On Monday I had the pleasure of attending the French Your Day! Event at Le Palais des Thés Soho. This event is a Francophile's dream! French canelé, Champagne, juices and of course top quality tea was served. Stations were broken up by time of day: Breakfast/Brunch, Afternoon Tea, and Cocktail Hour. 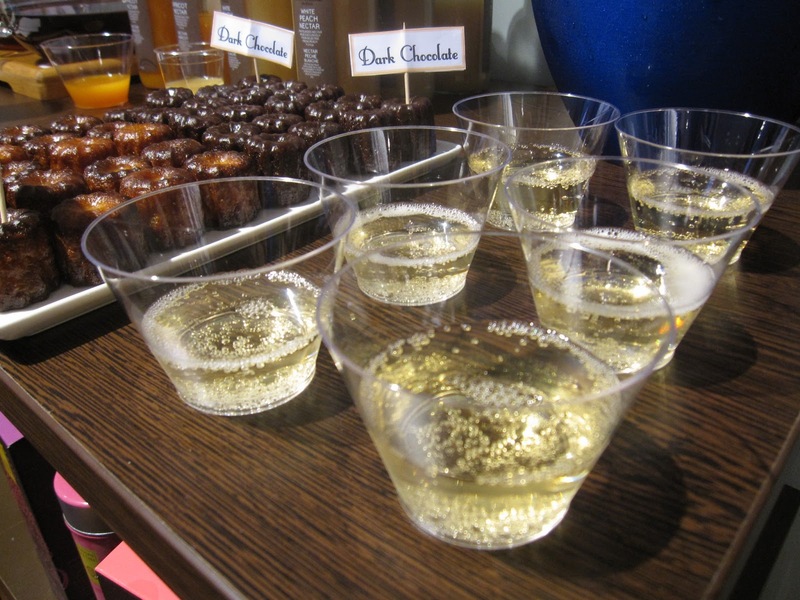 For Breakfast, we sampled flavorful fresh juices by Alain Milliat paired with Pommery champagne, dark chocolate and caramel canelé, and of course tea. Could there be a better way to start your day? The teas sampled were Big Ben and Thé des Lords. I'm personally not a huge Earl Grey fan, but I love the Big Ben breakfast blend. The Yunnan and Assam teas form an earthy yet robust flavor perfect to wake up with. This blend rivals my most favorite English Breakfast blend. The teas served at the event are part of the new 'My Tea for the Morning' package from Le Palais des Thés. This is a clever line of tea bags packaged for various parts of the day: Morning, Office, and Evening. These are perfect for travel, or of course to keep in the office. I may have to pick up a box since the 'office' teas contain some of my favorites from Le Palais des Thés. The canelé from Canelé by Celine were absolutely divine. A chewy caramelized crust on outside, with melting softness on the inside. Heaven! My two favorites are the dark chocolate, and black truffle. I adore black truffles, and this savory, earthy canelé was a delightful surprise. Celine was on hand to talk about her product, and it was fun to meet the creator of these decadent pastries. She does not sell in stores, but you can find her products online or at various events. The afternoon tea was served with the luscious canelé, (vanilla was my favorite), along with the ever popular Thé du Hammam mixed with Milliat blueberry juice. Sweet, floral, with a hint of green tea. A satisfying afternoon sip to hold you over until dinner...or cocktail hour! For cocktail hour we devoured the truffle canelé, with rooibos tea blends. Rooibos has never been a favorite of mine but it is a good choice for the evening since it is caffeine free. We also sipped Pommery Champagne with a refreshing herbaceous basil lemon syrup from Baume des Anges. The combination of flavors transported me to a patio out in the French countryside with a cool summer breeze. A lovely visual when you are actually in oppressive NYC humidity! The iced teas all had re-usable ice cubes. A smart idea to help the tea retain flavor instead of becoming watery from the melting ice. I am thankful for the invite to such a delicious event. It was wonderful to see folks I've been corresponding with such as Georgia from Notes on Tea and and Nicole from Tea for Me Please. Tea, pastry, Champagne, and great conversation. Perfection! I didn't realize the teas were part of a new line. Thanks for pointing this out. I could use an iced rooibos or Hammam right now and definitely one or more of the Milliat juices.